I love worn colors, bright colors that fart. But today no color but a total black look. Black is for me the chic color par excellence. We must go out, hop, a little black dress. A meeting pro, hop, I put on black jeans and a blazer. So today I propose a working girl look, a total black look with rock keys. 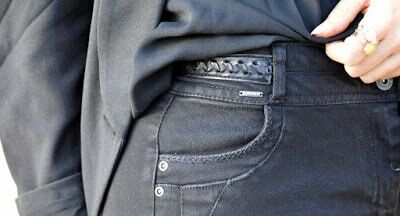 For starters, I’m wearing high-waisted black jeans found at Elora. So here it is a huge blow of heart! I’m still struggling to find high-waisted jeans that flatten well on the hips and buttocks. It is perfect, it is well pruned, it makes a bouncing diaper and is very well cut. My man loves it! I paired it with a basic black lingerie that comes from Grain de Malice. And to bring chic to all I opted for a black blazer Elora. The slightly loose cut and chain details on the shoulders give a very trendy glam rock touch. To lengthen the silhouette, I chose black boots with high heels that come from Blancheporte. Their square heel is very stable and the zipper on the front very rock. And I think they fit perfectly with the outfit. 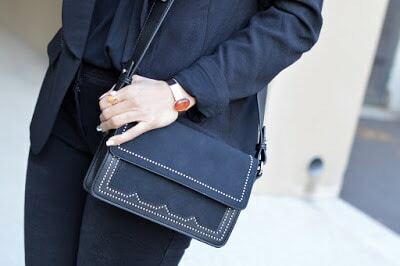 The black studded bag is also an Elora. It’s an excellent basic, the size is perfect and the strap is very modern.